These new images by Dutch photographer Iwan Baan show the almost-complete National Museum of Qatar, designed by architect Jean Nouvel. The new national museum is currently being built in the country's capital Doha, and is expected to open in December 2018. It will be formed from a pile of interlocking disks of various dimensions made from steel clad in glass-reinforced concrete. According to the architect, the building is meant to represent both the country's desert location alongside the sea. "Everything in this museum works to make the visitor feel the desert and the sea," said Jean Nouvel in a statement. "The museum’s architecture and structure symbolise the mysteries of the desert's concretions and crystallisations, suggesting the interlocking pattern of the blade-like petals of the desert rose." Along with permanent and temporary exhibition galleries, the museum will contain a 220-seat auditorium, 70-seat forum, restaurant, two cafes, shop and facilities for the storage and conservation of its collection. Jean Nouvel recently completed another large museum in the Middle East – a vast dome in the UAE that contains the Louvre Abu Dhabi. In Doha, the 53,000-square-metre building will stand alongside the 19th century historic palace of Sheikh Abdullah bin Jassim Al Thani, the former Emir of Qatar. The landmark was restored by Berlin-based architecture studio Ziegert Roswag Seiler Architekten Ingenieure in 2014 and will be incorporated into the museum as its central exhibit. The country of Qatar has recently completed several state buildings. 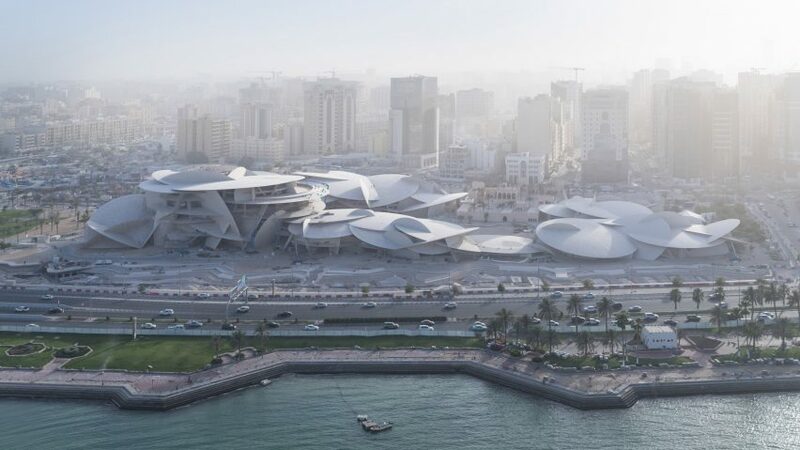 The Qatar National Library designed by OMA opened earlier this year, while the Qatar National Archive designed by Allies and Morrison was completed in 2017. The city is also gearing up for the World Cup in 2022, with Fenwick Iribarren Architects' Ras Abu Aboud revealing a proposal for a stadium constructed from shipping containers.